This book is surprisingly thick at 350 pages. 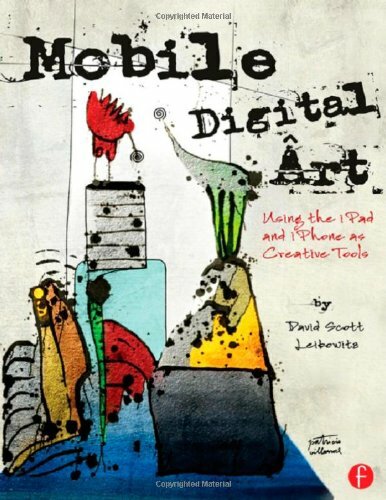 The book is targeted at those who use mobile devices to create art. That would be the iPad and iPhone users since there are more drawing apps available on those platforms. The subject matter is split into three sections. The first covers paintings and drawings. The second focus on photography, collage and photomontage. Last section covers abstract, background and conceptual apps. The first section is pretty clear cut. The second section is sort of like using Photoshop to manipulate or edit pictures, in this case Photoshop is substituted with other apps. The last section is for those who like abstract art. Here, there are some interesting apps that can generate art. In general, the tutorials can be grouped into two types. There are some artists that talk about their process of making digital mobile art, and the other group covers the more technical aspect of using the apps. Some would use a single app throughout, while others like to use several apps as each has their own specialty and effects. The quality of art featured in the tutorials is mixed bag, for good and not so good reasons. It's not so good because most of them can look a bit rough, unfinished, or feel like doodles. The good part is through the tutorials, you're introduced to new apps, the process of drawing on mobile devices, or may discover a feature you want in some other app. It's great to check out what apps other artists are using. 70 artists are included in the book. There's an artist gallery at the back and the artworks there are significantly better and represents the potential of mobile digital art. So I wonder why most of these artists did not have their tutorials included. Hopefully, in the future, there may be books dedicated to just a few selected drawing apps with more in depth tutorials and examples. The main drawing app featured is Brushes, probably due to its popularity. The two main apps I use are FiftyThree's Paper and Wacom's Bamboo Paper. Other popular apps (in my opinion) not covered or have limited coverage are Procreate, ArtRage and Sketchbook Pro.